Oberon the Irish wolfhound is off to Portland to smell all the things with canine companions wolfhound Orlaith and Boston terrier Starbuck, and, of course, his human, ancient Druid Atticus O’Sullivan. The first complication is an unmistakable sign of sinister agendas afoot: a squirrel atop the train. But an even more ominous situation is in store when the trio plus Atticus stumble across a murder upon arrival at the station. They recognize Detective Gabriela Ibarra, who’s there to investigate. But they also recognize the body—or rather that the body is a doppelganger for Atticus himself. The police, hampered by human senses of smell and a decided lack of canine intuition, obviously can’t handle this alone. Not with Atticus likely in danger. Oberon knows it’s time to investigate once more-—for justice! For gravy! And possibly greasy tacos! Alongside his faithful Druid, Oberon and the other loyal hounds navigate by nose through Portland to find a bear-shifter friend with intel, delicious clues at the victim’s home, and more squirrels. Always more squirrels! But will our hungry band of heroes be able to identify the culprit before someone else is murdered? Will there be mystery meat in gravy as a reward or tragedy in store for the world’s (or at least the Pacific Northwest’s) greatest dog detective. There is nothing funnier than a story from the dog’s point of view, especially one as complex as Oberon. 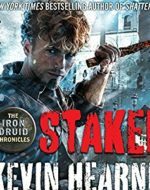 This is a must for all Iron Druid fans. Oberon, Orlaith and Starbuck want a trip into Portland to smell everything and Atticus gives in and takes them on a train ride to Portland. The dogs notice a squirrel on top of the train when they board and no one is more surprised than Atticus that the squirrel manages to hold on for the entire trip to Portland. 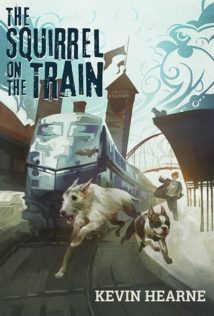 The dogs chase the squirrel off the train and into the station where they come across a Detective they met in the prior Oberon mystery, and a dead body. A dead body who is a dead ringer for Atticus. Atticus and Oberon need to figure out who this look alike really is and who was the real target of the killer: the deceased look-alike or was this one of Atticus’s many enemies who now thinks they finally succeeded in killing the last Druid. 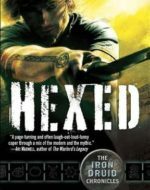 These mystery novellas are funny and unique because they are told from the point of view of Atticus’s hound, Oberon. For those unfamiliar with the series, Atticus is a 2,000 year old Druid who survived the Roman’s decimation of the Druids millenia ago and invented Immortali-Tea which he drinks to keep from aging. He also feeds the tea to his hound, Oberon, who is about 35 years old. Atticus also did a druid binding to the mind of Oberon so he has quite a vocabulary for a dog and a great love for movies and pop-culture. And like all dogs, he has a great dislike for all things squirrel. 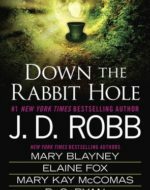 It was an interesting mystery, told in a unique style. I do not understand why humans tend to fear clowns more than squirrels. Atticus says it’s probably all Stephen King’s fault, which doesn’t make much sense to me, but I’m sure he’s right. That still doesn’t explain why people are ignoring the mountains of evidence that squirrels have a sinister agenda and the ability–the agility!–to carry it out. They can climb trees and dang near anything else and circumvent the most sophisticated security systems. They’ve stolen my snacks and eaten them in front of me from the safety of a tree branch high above my head. That’s evidence of raw, unchained evil for you, right there. Know how many clowns have done that to me? Zero. And if a clown wants to try anything, how fast is he going to move in those oversize clown shoes? Not fast enough, no sir. He certainly won’t be climbing a tree in them. Whenever I try to convince Atticus that squirrels are most definitely involved in a shadowy plot to kill us all, though, he dimisses it and says, “I should have named you Mulder,” because apparently, I’ve crossed a line somewhere that makes me an unhinged conspiracy theorist. But Orlaith believes me, and Starbuck too. Starbuck is starting to learn some words, and so far he has divived the world into [Yes food!] and [No squirrel!] demonstrating that he’s got a fine head on his shoulders, even if his ears are sort of batlike and his face is all smooshed in without a proper snout, like all Boston terriers.